This article was republished by the Significance, the official magazine of the American Statistical Association and Royal Statistical Society (UK). You have probably heard that the price of crude oil has tumbled from $115 per barrel (159 litres, an archaic but established unit of measurement) in June 2014 to $54 in March 2015. The price of oil has halved in 9 months. The glut is mostly due to America producing more oil. Although most of us think of Saudi Arabia as the world’s largest oil supplier, in actual fact the United States has had this title since 2013. In 2014, America was responsible for around half of the net increase in world oil output, due to a boom in the shale gas industry there. Its increase was akin to adding one Kazakhstan to the world! All of this excludes all the natural gas the US got out of fracking, which also makes it the #1 gas supplier. Historically, Saudi Arabia has played a stabilizing role in world oil prices, by adjusting its output to ensure global supply is stable. 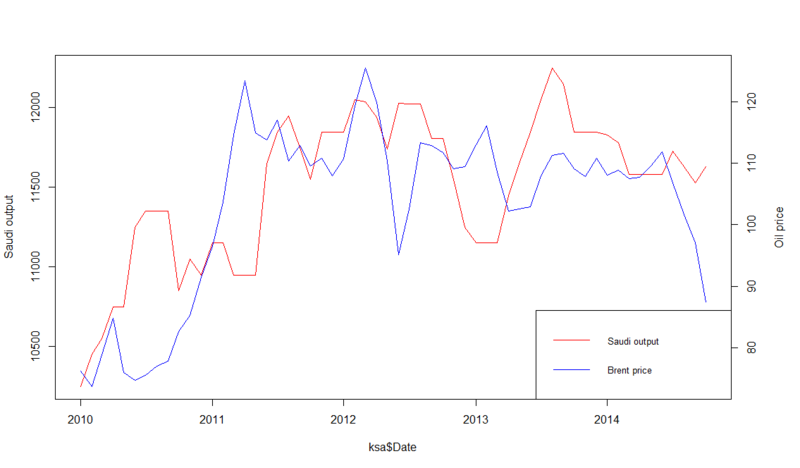 The below graph show how Saudi output increased to lower prices when they were high, and vice versa. 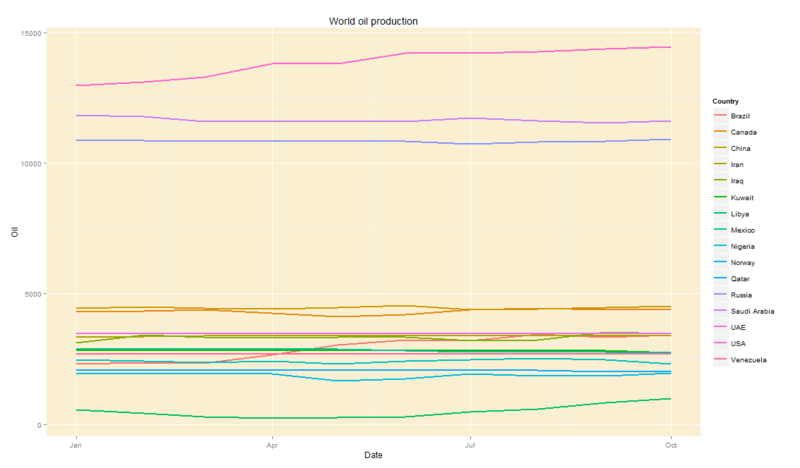 However, since July, the Saudis have not responded to newly low oil prices by decreasing output. In fact, the Kingdom have insisted that they would rather bear lower oil prices than decrease their market share (read: be squeezed out by shale). The Saudis have historically stabilized prices, but no more. Saudi Arabia is backed by the other members of the Gulf Cooperation Council – UAE, Qatar and Kuwait. Together, the GCC are responsible for more than a fifth of world oil output, so their inaction towards falling prices has been instrumental in ensuring that oil prices remain low. But why have the Saudis and their allies been so passive? Motive 1 – Shale: One reason the Kingdom is depressing prices is to thwart the growth of the nascent shale gas and bitumen oil industries in America and Canada. The threat from these new industries to Saudi Arabia is real – In October, America ceased Nigerian oil imports, even though Nigeria exported almost as much oil to America as Saudi Arabia as recently at 2010. Meanwhile, Canada steadily increased its exports of bitumen oil to America during the same period. However, new shale projects require $65 oil to break even. At $53 a barrel, the shale boom has been paused, and several investments have been called off, their returns in doubt (although many existing wells remain online). If the Saudis allow prices to increase, the threat of shale will likely resume, so it does not look like they will allow prices to return to their pre-June levels. But the current price level is sufficiently low to keep the threat at bay, so the Saudis need not increase output further. At the same time, $53 oil will stop new shale projects from coming offline, so it is unlikely that North America can contribute to the supply glut any further, either. It is for these reasons that oil proces are unlikely to tumble much further. Motive 2 – Iran: However, I believe the Saudis have also depressed prices to hurt Iran and Russia, both of whom make most of their export revenue from oil. Iran’s expanding influence in the Middle East has rattled the Saudis considerably. In addition, both Iran and Russia remain staunch defenders of the Syrian government, which the Saudis and Qataris despise. The Saudi’s reserves of $900bln provide the kingdom with a buffer, but will likely force Iran and Russia to think twice about expensive foreign projects like Syria, right? But it does not look like low oil prices have reduced Iranian, or even Russian, involvement in Iraq and Syria. Iranian General Soleimani is openly marching through Iraq as an “advisor”, while Iran-backed militia have made the bulk of gains against IS. Meanwhile Assad has held onto power, two years after most media outlets pronounced him as good as overthrown. All of this has happened against the backdrop of low oil prices. Thus, it does not look like there is much value in continuing the Saudi strategy of depressing oil prices to curb Iranian influence. Other producers, like Nigeria: The second graph shows that other oil producers like Nigeria (produces 2.3m barrels a day or 2.6% of world oil: more than Qatar but less than UAE) have generally kept output constant. Most major oil producers – nations like Nigeria, Venezuela and Iraq – cannot afford to decrease oil sales, which are critical to their economies. They are probably not too happy about low oil prices, but have little choice in the matter. Finally, fortunately or unfortunately, the conflict in Libya has not depressed their oil output. Wild card Iran: Iran exported 3m barrels of oil per day in 2006, and sanctions have reduced this number to a meager 1.2m per day. A barrage of nuclear-related sanctions since 2006 have imposed an embargo on Iranian oil exports to the EU, prohibited investments in Iran’s oil industry, and barred banks from mediating transactions involving Iranian oil. But as sanctions are eased, Iran’s oil exports will certainly increase, and this may lower prices even further. However, the timelines for increased Iranian oil exports are unclear. They depend on the speed at which sanctions are repealed and the pace at which Iran can ramp-up output: The timelines for repealing nuclear-related sanctions imposed by the P5+1 will only be unveiled on 30thJune 2015; Iran has 30m barrels of oil ready to ship out immediately, but beyond this stockpile, it will takes years for Iran to bring its oil industry up to speed. If sanctions are eased and Iran increases oil exports within a year, Saudi Arabia may actually reduce their output. Allowing prices to drop further will not serve the kingdom’s interests. Current prices are already low enough to keep shale at bay. The kingdom could very well lower prices to hurt Iran, but low oil prices do not seem to have worked to curb Iranian influence so far. Any Iran-related decreases in oil prices will also be bound by the $50 psychological resistance (although this was breached in January) and the 2008 low of $34. In summary, I do not think will see $100 oil any time soon, but I also do not think oil prices will drop much further than they already have. Data from US Energy Information Administration; graphs produced on R.
Do you think Obama will lift the oil embargo on iran in new negotiations even though it will decrease the oil prices even further? Quite a bit of political commentary for a stats blog, but I like it. Keep it coming. Thanks, Sid. The data is the evidence, but the geopolitics are the inner workings. The current framework may repeal US sanctions on investing in Iranian oil businesses. But the law that banned Iranian oil exports to America was enacted in 1979, after the hostage crisis. That will only come down after additional negotiations. Obama will probably pass the former. The latter is only a matter of time. Excellent article. Been a while since I read some political commentary on your blog but this one was worth the wait. A very good analysis on oil prices by including both the economic and political perspectives. Last but not least, those neatly drawn graphs which reinforce the exact purpose of your blog. Great going Abbas!